The arrest in the past two weeks of Arnaldo Otegi and nine of his comrades from the ‘outlawed’ Batasuna party and the pro-independence trade union LAB is another sign of the oppressive methods being employed the Spanish government to stamp out the Basque nationalist left. Batasuna has been deemed banned by the Spanish state since 2002 when a law was passed which stated “that under certain conditions if a party supported terrorism it could be outlawed”. The law itself is so open-ended that any party could be banned, even if its so-called support for ‘terrorism’ was as slight as putting money in a collection box for political prisoners. 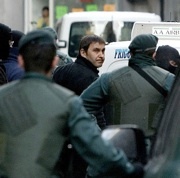 The raids on LAB’s offices and the arrests of its members outraged trade unionists across the Basque Country and Europe. In response, around 40,000 people rallied in Donostia/San Sebastian last Saturday [October 17] in a demonstration that was supported by the six major trade unions in the Basque Country and several political parties. The European Union, the US administration, the establishment press and the other leading lights of the ‘free’ world have so far failed mention the attack on democracy in the Basque Country. The ruling is a disaster for democracy across Europe as any government with a “pressing social need” could ban any party which is a threat to the status quo. The plight of Batasuna and the other pro-independence Basque groups can be compared with that of the British National Party, which is allowed to stand in elections and take their seats in whatever assembly they are elected to, even though they openly espouse racial hatred and fascistic beliefs. This week, the BNP appeared on BBC, while, in another part of the EU, Batasuna’s leaders languished in prison cells for nothing more than demanding national independence. What should be worrying for all political activists is that what is happening in the Basque Country could happen anywhere in the EU under the new rules of ‘democracy’ as laid down by the ECHR judgment of July 2009. Basque activists in trade unions, political parties, youth groups and social movements are fighting a battle that we might all have to fight some day; a fight that has to be won or our rights as people to choose who we wish to govern us will be dead and buried with no chance of resurrection.